Braces - Kamran Kashirad, D.D.S. 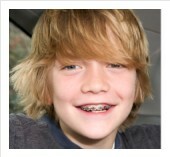 If you live in or around our area and are considering dental braces for your children, call us today! One way in which adult orthodontics is different from children’s orthodontics is that unlike children, adult’s bones are not in a state of change. Because of this difference there is slight increase in treatment time for the bones to shift. To counteract the increased treatment time, there are many advancements in orthodontic braces that result in reduced treatment time and are still esthetically pleasing. If you live in or around our area, call to schedule an appointment with us today to find out more about adult orthodontics and if they can improve your oral health.